Hit a show with one my boyfriend's friends (my boyfriend and his friend's wife were there too). The show was about an hour from my home, but we got food, ice cream and baseball cards. It was a good day. 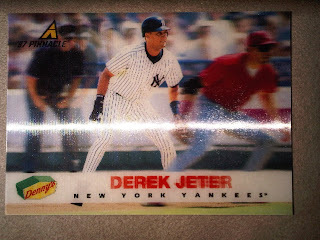 I picked up 62 of the O-Pee-Chee cards I needed to complete my set for .15/piece, including a Derek Jeter. Here are the some of the singles I picked up. 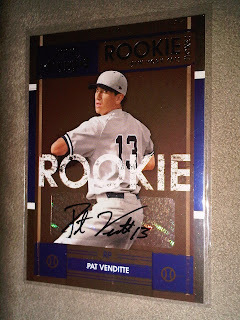 This is Pat Venditte, a 'prospect' in the Yankees organization. I put prospect in quotes because he really isn't considered a high prospect, but he is ambidextrous. He can pitch effectively with both arms. Venditte isn't in Baseball America as a Yankees top 30 prospect, but he was recently promoted to Single-A Tampa from the Charleston RiverDogs. In Charleston, he had a 1.47 ERA out of the pen. He threw 30 2/3 innings with 40 K and just two walks. This is a Jorge Posada/Carlton Fisk dual jersey card from this year's SP Legendary Cuts. 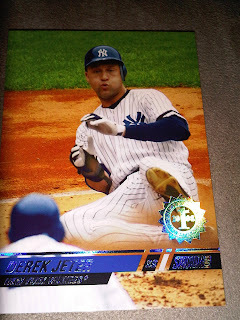 Here are my Jeter hits. 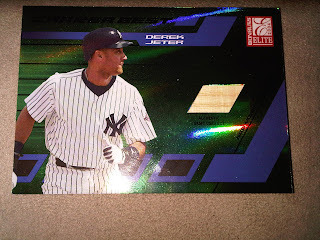 This is a bat card (more like a bat chip, but I like it) numbered to /200 of Jeter. I like bat cards more than I have liked Jersey cards. 2008 Stadium Club 1st Day Issue /599 (the guy selling this card was amazing. I got this card and 10 other various cards for $4. 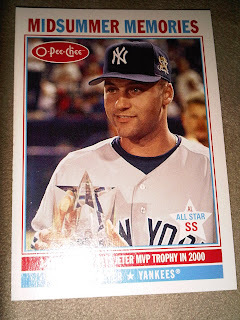 You don't usually get Jeter cards that cheaply). 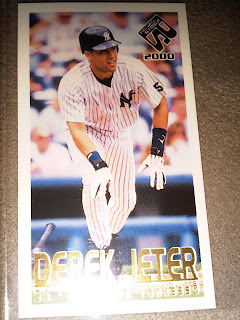 Not pictured were a few other Jeter cards from various years. I also picked up some other Yankees, but not too many: two Jobas and a Phil Hughes, I believe. There is another card show next week in Wildwood, NJ at the Wildwoods Convention Center. I'll be going on Friday early in the morning to avoid the holiday traffic. Harmon Killebrew does an amazing impersonation of Carlton Fisk. Lol, thanks. I napped for an hour before I wrote this. Still trying to wake up. I don't think the doors open until the afternoon on Friday. Denny's! I swear the best cards are the giveaway/advertising cards.